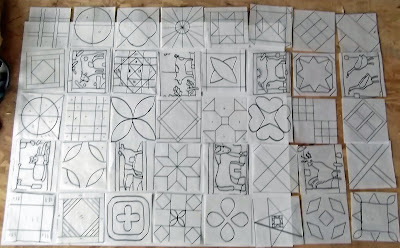 This is the second incarnation of my SJ rug plan. There will be five blocks across and eight blocks down, a total of 40 blocks, with a half inch sash between all blocks and an inch wide sash around the outside. The rug, before whipping, will measure 34.5" across and 49.5" down. I divided the blocks into five types. 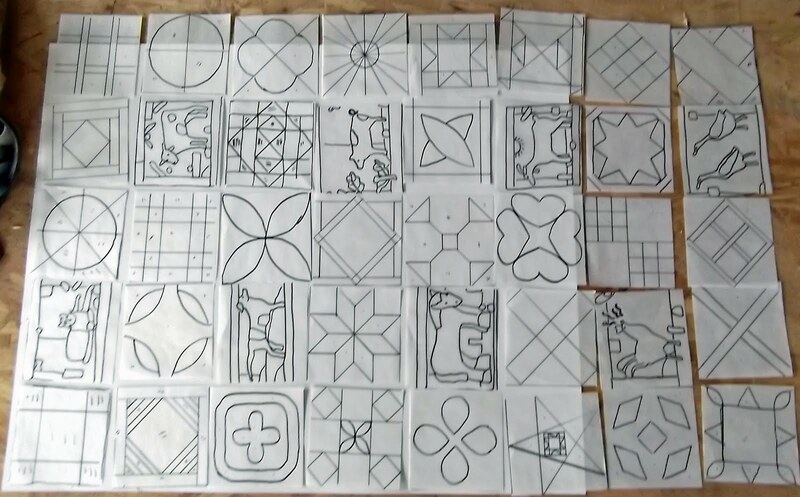 The first type is animals, and there will be one animal block in each row - I haven't yet decided if they will all be upright, the way they are in the photo, or if they will be turned in several different directions so the rug doesn't have a top and bottom. The other types are rounds, triangles, straights, and stars. Each block falls into one of those categories and my plan is to scatter the different types throughout the rug, with no two blocks of the same type next to each other. The photo shows two blocks that should be moved - at the far right (if you're standing to the right of the photo) the last blocks in the second and third rows are two rounds next to each other. Photos can be very helpful. Now, I have to start working on color. I'm thinking antique black sashing with mostly red and a light gold for the block colors - the light gold taking the place of the white in the original quilt. Hi Phyllis, this looks great to me. I like the animal idea very much. I have thought about joining but am scared to take on another large project although make a Block a month wouldn't tie me down so much and I could use my dyed color wheel colors and work the mat for the Merit Award.....hmm did I just talk myself into this! Oh Oh, thanks for the inspiration.